WeTip’s School Safety Program offers the WeTip anonymous hotline to students and their families. WeTip’s hotline is a way for people to get involved in establishing a safer community. Students are often afraid to report crime information because they fear reprisal from the person they are reporting. WeTip gives students and their families an opportunity to give information without fear. 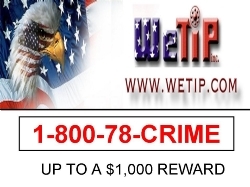 WeTip information is immediately conveyed to the appropriate police, fire, and sheriff’s agencies.